While ago, I had bookmarked this post by Wellness Mama in which she stated, “The only way I’ll drink coffee.” Of course I was intrigued! I’ve been drinking coffee since I was 14 and have tried pretty much every variation. 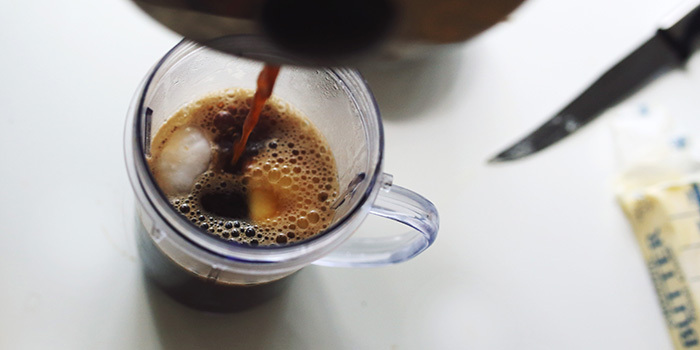 I’m not a coffee snob (But I don’t really like crappy coffee. So maybe I am.) I’ll be honest, I haven’t really even investigated the idea of a quality coffee bean but since I discovered Bulletproof. Since this past weekend, we’ve upgraded our coffee and I’m excited to use it. So what it is? It’s adding oil and butter to a really quality cup of coffee. Pretty much everything our society has told us NOT to do. The idea of butter in coffee can especially freak people out. BUTTER IN COFFEE? Yeah, it’s unsalted. And it’s amazing. Believe me, it’s much better than adding in tablespoons of sugar, soy milk or skim milk. Here at Considering You, we love healthy fats. This recipe has all of that. After one drink of Bulletproof coffee, you’ll never be tempted to eat fat-free, insulin-raising, fat-storing toast and oatmeal breakfasts again! Um. Sold. It improves brain function. Gives us energy. Helps us lose weight. It tastes great. Oh and I used decaf during the photoshoot since it was 7pm. I already am a night owl. Blend together! I use my Magic Bullet. Do you drink Bulletproof coffee? Or a variation? Let us know what you think! Very interesting!! I am going to go make myself some right now and will post the results of taste and energy results later this morning. Hi Katie!! Great hearing from you. I don’t think 2 cups would be too much at all! Oh gosh, i dunno, right now just thinking about that is giving me a stomach ache, lol. I guess i’d have to try and see! HAHA. This made me laugh. It’s definitely not for everyone but we really love it! It melts! It would be pretty gross if it didn’t haha. Oh you can definitely use raw sugar! I am into it! I feel like Coco Cafes give a similar feeling (coconut water / espresso) I’m totally going to try this! Yes! Let us know if you love it, Heather!! We made ours without the stevia, used vanilla extract, with celtic grogg coffee. posted it on instagram @ampersandsocial ! Love it. Going to try to find that stevia though. where’d you get it Allie? So awesome! I got my stevia on Amazon! Perfect timing! I just ordered by Bulletproof Coffee yesterday. I’ll be trying this out ASAP. Thanks for posting. Tried it out this morning! I used a 1TB of butter in 2 cups of coffee and it tasted great. Loved the butter taste, have amazing energy today and wasn’t craving snacks/sugar in the morning. Adequately hungry for lunch and feeling good. 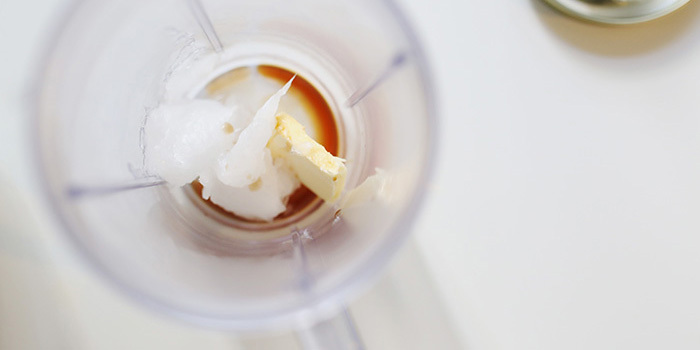 PS – Bulletproof Coffee does suggest Coconut oil if you don’t have MCT oil. Oh awesome!! Seriously we love hearing people who love this too. Allie, I’m afraid this is NOT the recipe for bulletproof coffee. 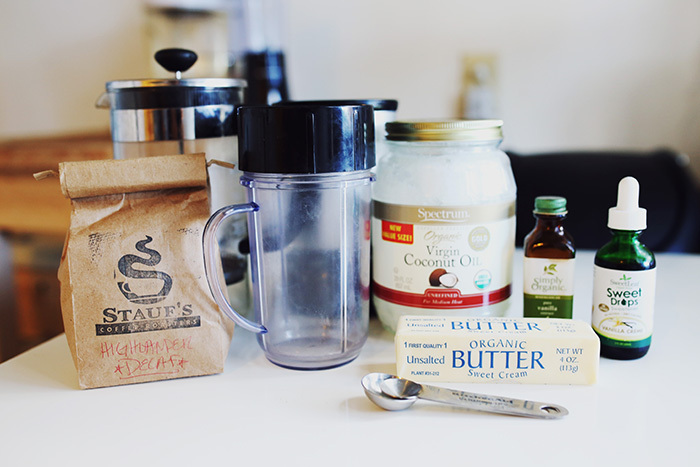 Coconut oil is specifically NOT used in Bulletproof Coffee. And the butter quantity is far too low. Thanks for pointing that out!! We’ll make sure to make a note of the original recipe and Wellness Mama’s too! Today, I put a little cinnamon in my mix before adding coffee. Really good. Wow. Celtic Grogg coffee, sans stevia, this is perfect. Thanks for sharing. As a endurance runner I need some eggs in morning but am a huge believer in the almighty power of real butter. Will let you know how it goes over a few weeks. Cheers! A little cacao butter, vanilla and / or chocolate powder in the mix goes down really well too. This sounds yummy! I usually have coffee with coconut oil with my breakfast but I’ve been in a breakfast funk (eggs are getting old!) so I’ll have to give this try to switch things up! I buy raw cream at our farmer’s market and make butter from that. It’s super easy! I would love to do that! It really is so stinking easy as long as you can get your hands on some raw cream. Whoa, can’t wait to try this!